With surging demand for the newest computing architecture i.e. Cloud Computing, Industrial giants like Amazon, Microsoft and Google have made it extremely difficult for small and medium sized players to even survive this fierce competition. However, the different elements of this projected $200bn industry like Networking Product Manufacturers, Cloud software solution providers etc offers various lucrative investment opportunities. One of the emerging players in this industry is a small Networking Product manufacturer called Applied Optoelectronics. With 75-80% strong revenue exposure to growing hyper-scale/cloud computing business, the Texas based Communications Equipment Company “Applied Optoelectronics” is one of the leading providers of Cloud computing fiber-optic networking products. It has achieved 112.4% YoY revenue growth in 2017 Q2 and recent industrial trends show that the rally in the revenue is expected to continue for a considerably long time. The bulk of the company’s business comes from the titans of the Cloud Computing Industry i.e. Amazon and Microsoft who increased their fiber optic component orders for upgrading data centers to around tenfold in last three years. Looking at the financials, Applied Optoelectronics is currently in the growth stage of corporate life cycle. It has generated CFROI above the discount rate in last 4 years. The firm’s gross investment base i.e. assets grew at a rate as high as 42.90% during 2012-15 and then remained relatively stable thereafter which is again expected to increase in next 2-3 years due to the surging demands. The company has generated impressive shareholder returns in past 2-3 years and has maintained strong sales growth in last 4-5 years. Applied Optoelectronics has consistently improved its operating margins and asset efficiency in past couple of years. The HOLT Operating margins have nearly doubled from 12.92% in 2011 to 26.95% in 2016 thus positively contributing to the ROI. The company’s vertical integration and consistently improving ability to supply its own lasers have improved its asset efficiency by around 40% in past 5-6 years. With Debt/Equity ratio of 0.12 (Total Debt – $35.2 M), the company is relatively less leveraged than its peers operating in the industry. It is currently trading at an earnings multiple of 16 which is much better than the industry average of 25 and has a TTM operating margins of around 22% which is impressive when compared to the sector average of around 5.87%. The Return to Equity (ROE) levels of the company also looks lucrative at around 35% and with a healthy Free Cash Flow Margin of around 18-19%, the company seems to offer a great investment opportunity. Other Traditional Valuation metrics like Price to Book ratio which is currently 1.90 (Industry Average – 2.6) makes the Applied Optoelectronics stock currently undervalued. The company’s sales and assets growth for the previous year are 37.29% & 19.92% which is higher than the median growth of the peer group i.e. 4.5 % and 6.7% respectively. The forecasted Economic Profit for the company is expected to be $107Mn and $113Mn for 2017 and 2018 respectively which is around 370% more than the Economic Profit generated in 2016. The rise in sales growth and eventually the economic profit is attributed to the almost non-substitutable product manufactured by the company for the rapidly growing Cloud Computing services i.e. the 100-gigabit fiber optic transceivers which are rapidly replacing the Copper Based Ethernet cables. Though The demand of these latest fiber optic transceivers is outstripping the supply, The company is already developing next generation 200G and 400G for near future. Its recent stock price plunged down to $56.76/share after reaching all time high of around $99.61/share in August due to low sales of traditional 40 Gigabit transceivers in the Q2 earnings. The transition in demand of these traditional transceivers to the almost non-substitutable 100G transceivers has turned to be a bit faster than expected, resulting in a temporary revenue hit for the company that is shifting its production line as per the demand. Applied Optoelectronics has also emerged out to be a solid acquisition candidate as some rumor of offers from companies like Cisco and Shenzhen based Huawei Technologies have recently prevailed in the market. Though these rumors remain unconfirmed by both the parties, the recent bid bagged by Huawei Technologies from China Telecom for evolving the intelligent optical networking add some strength to it. Some other reports about the leader in Cloud Computing Industry i.e. Amazon is testing new ways to order fiber-optic components from other manufacturers can pressure Applied Optoelectronics to sell itself to some giant player and expand its business from the support of a parent company as it is struggling to fulfill the demands and has to invest in R&D of the next generation 200G and 400G transceivers. Looking forward, the company is expected to continue receiving higher demands from all the major players in cloud computing space and with highly competitive cost structure, superior technology, best in class momentum, valuation and operational quality, the company is expected to generate excellent returns for its investors. The historical analysis of the company also shows its best-performing styles across economic cycles and its CFROI levels are forecasted to improve significantly to around 24.5% in 2017 and 18.5% in 2018. 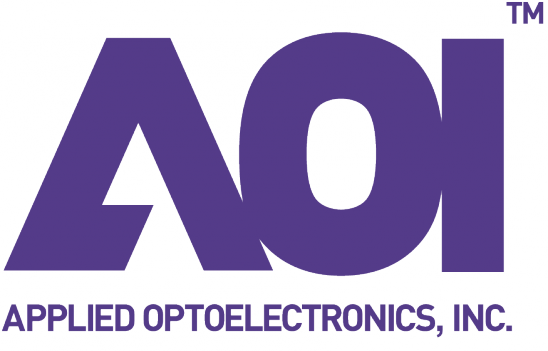 The valuation of Applied Optoelectronics suggests a straightforward answer: BUY - (NASDAQ: AAOI). The recent and projected growth in demand for its almost non-substitutable 100G transceivers by tech- titans like Microsoft and Amazon to offer better Cloud Computing Solutions, exposure of 75-80% to a Cloud Computing Industry which itself is poised to experience more than 20% CAGR, improving operating margins and assets turns, relatively less leveraged stock, a solid acquisition candidate and potential of getting benefitted for having the first mover advantage in manufacturing 200G and 400G fiber optic transceivers in near future makes it an impressive investment candidate. According to the HOLT Valuation methodology estimates, Applied Optoelectronics is significantly undervalued at CMP of $56.76/share and has a +427% upside potential with a warranted price of $299.30/share. Investments at price levels of around $60 a share can turn out to be extremely profitable in a time frame of 18-24 months. Is local government debt a serious threat to the Chinese state? Will space travel industry be more attractive than airline industry?